The Basics skills for sand riding: The tires need to float on top of the sand. The moment the front wheel sinks in, it snakes virtually uncontrollably, you lose speed rapidly, wich makes the front dig in even more, and no matter how much horse power you have, you cant pedal yourself out of the sinking situation. 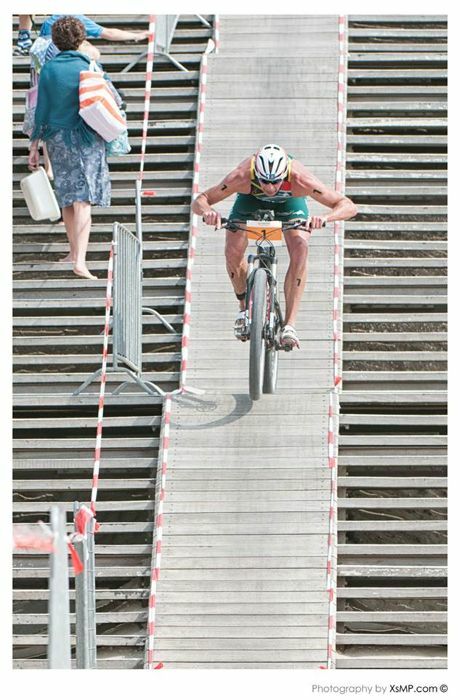 The trick is to recognize at what speed failure is inevitable- and smoothly jump off cyclo cross style and hoof it. 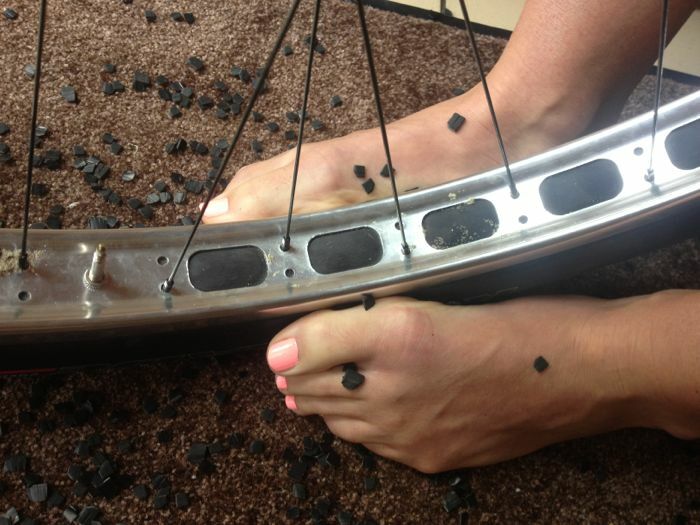 The surest way to go far in soft sand is to follow an existing tire track. 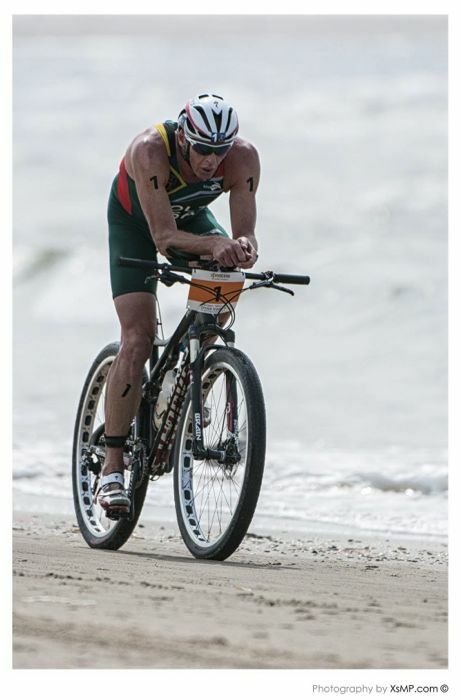 This race was 4 laps on the bike, so there were plenty of tracks to follow- the trick is finding a straight one. 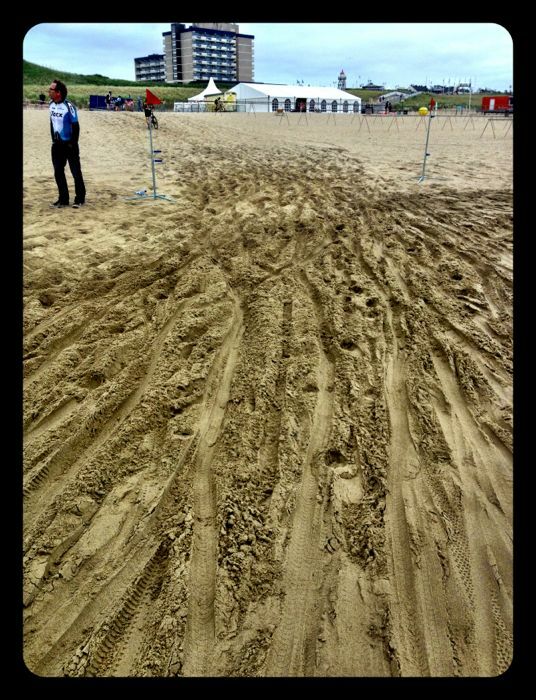 The back markers leave the last tire tracks, so being the leader is hard- plus, if all goes well, you’ll be making a nice, straight line for the riders behind you… Note: the lead motor bike’s trail seems invitingly wide and straight, but the knobbies churned up the sand making it a true sand trap. 1) Wide. Its hard to find wider than 2.3. 2) Low pressure. The locals talk about 18 psi, but I went as low as I could without rolling the tire in the corners on the pavement and hitting the rim on the stairs. 3) Supple casing. 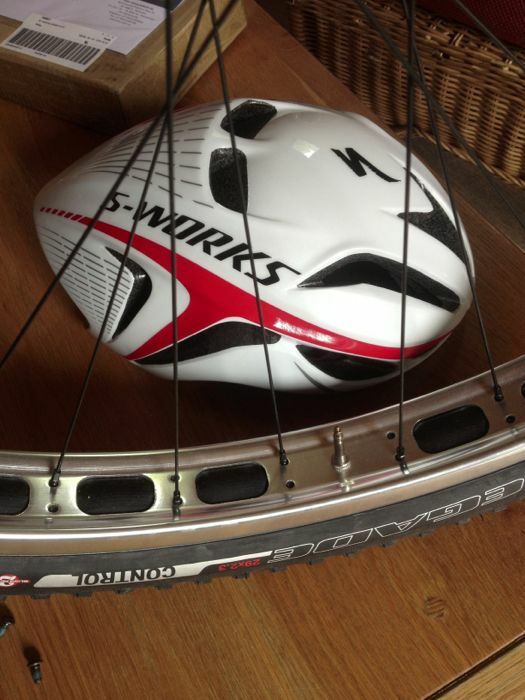 Which is why I switched from my normal more durable Control casing to Sworks. 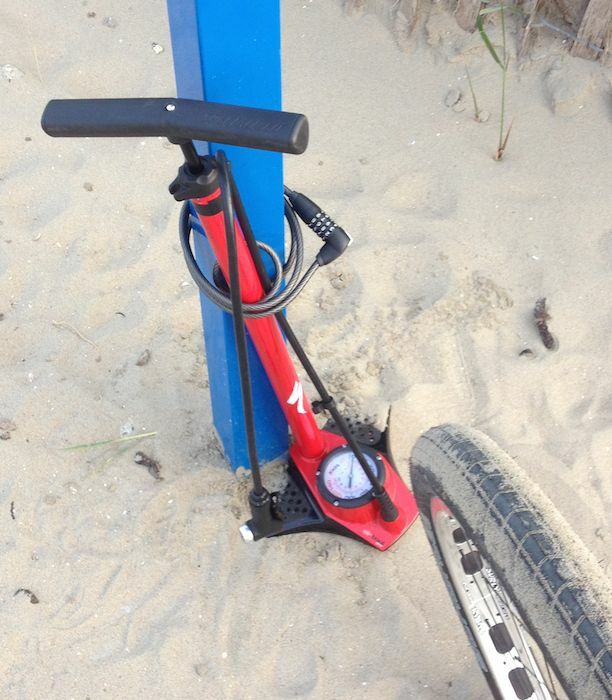 A gem I learnt from the lads at the local Specialized dealer: Knobblies digs the tire into the sand. Instead of providing traction, it pulls you into the sand. 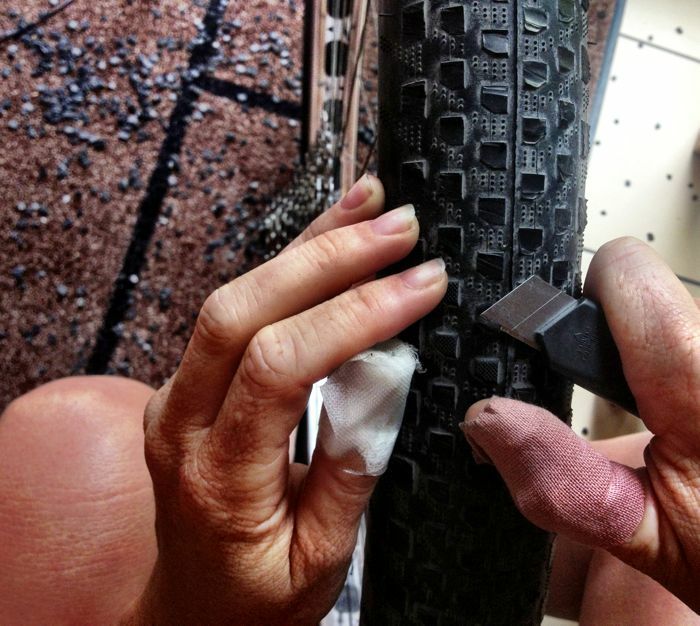 Fact: Dutch riders are known heat knobby tires with a blow torch and flatten the knobs by hand once the knobs are hot!?! Now I know what the Dutch do during those long, dark winters! Seriously: 4psi worked best for sand. And sand only. I think wide rims is the future of all kinds of MTB wheels. 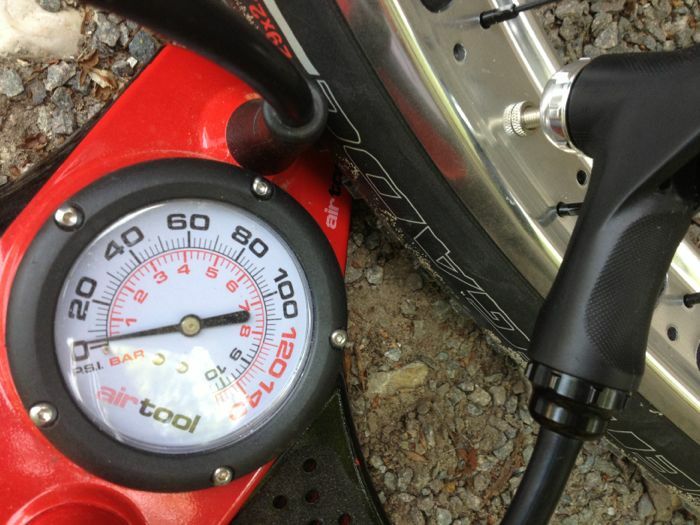 It “squares out” the tire profile- giving the tire a bigger volume (a good thing) and stiffening the sidewalls- less rolling and folding at lower pressures. This set up is really huge -I never measured them, but they fit through the fork with about 5mm to spare. I think a light rider could possiby have ridden everywhere with these. For me, I think a fat bike is what I needed. The one with the 3′ wide tire. 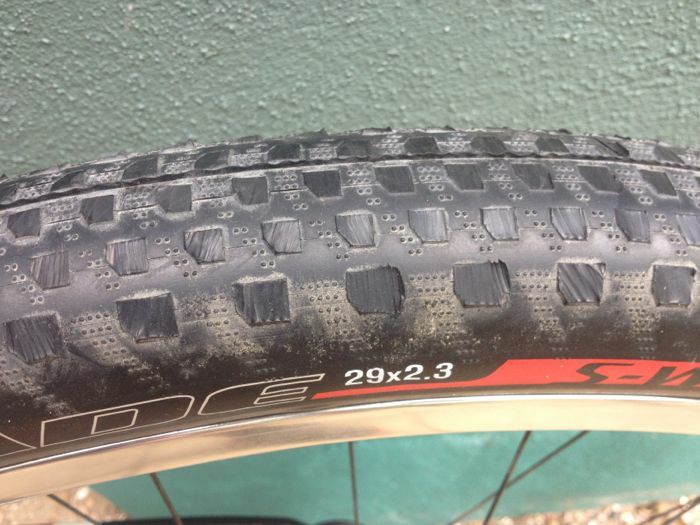 The Enemy’s tire is 600g and the Sworks 2.3 Renegade is 530g WITH all its knobbies. Wonder how much it would be without? 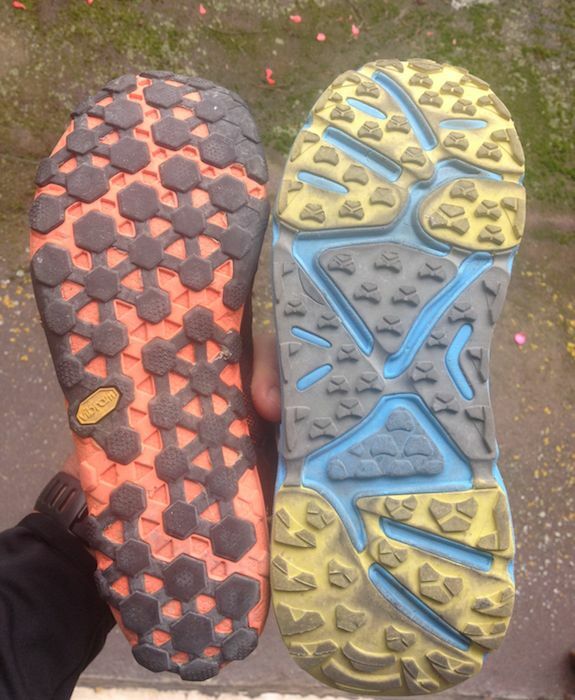 I didnt feel much difference between the two tires, so armed with above mentioned knowlege…. We had two box cutters with 4 spare blades each and went for it. 1 small mistake and the only “right” tire I had would be ruined. Big, bald and beautiful. And surprisingly grippy on all surfaces. Like I said- bigger (tires) is better. For all kinds of riding. A hard tail bike would be an option, (some of the Dutch and Belgian athletes like Jim Thijs had specially built beach racing bikes with rigid forks, special geometry, V brakes etc) but I just rocked my trusty Specialized Sworks Epic 29er. I set the Brains (fr and rr) on fully firm and increased the compression a bit, and was very thankful for the dual suspension on the numerous stair sections. Of course the Command Post saddle dropper proved a winner on the stair sections. 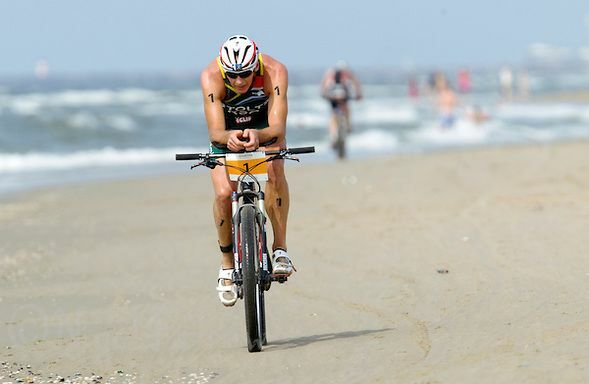 Even though I have never pushed my bike as much as I did on this race, (not even XTERRA Brazil 3 weeks ago) I knew that aerodynamics would play a huge role on the fast, open sections, compounded by the well known winds on the beaches of Holland. Because drafting was allowed, and I was planning on riding by myself, I had to tick all the aero boxes. But the TT bars isnt everything in #aeroiseverything. At Specialized we take aerodynamics seriously, hence the recent #aeroiseverything campaign. 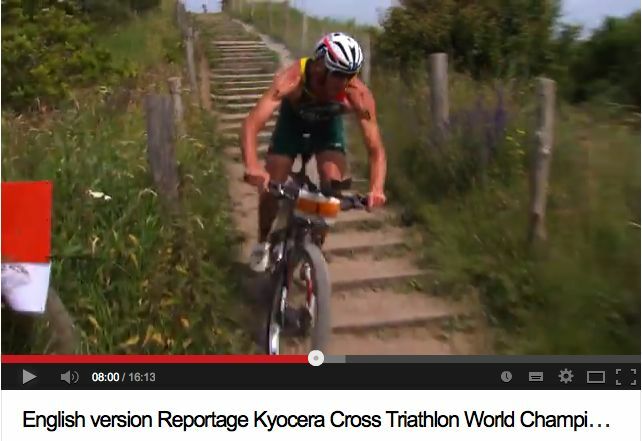 (Ned Overend has been asking for aero MTB products for years.) As you may know, Specialized built its own wind tunnel this summer, since it is secret no more, we dont have to refer to it as “The Water Bottle Factory” anymore. 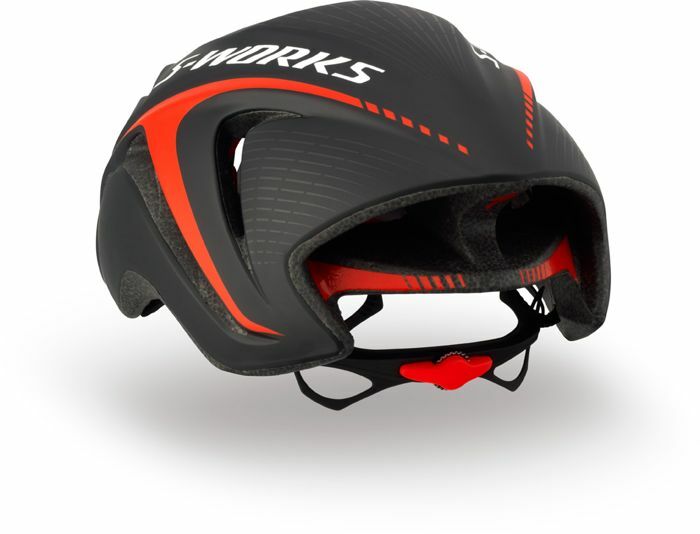 On a recent visit, I was learnt the astonishing data on the new Specialized Evade helmet. Which you have seen branded with “Sworks “on the Manx Missile (Mark Cavendish) and unbranded on various triathletes like Javier Gomez at ITU and some Caveman at Rev 3 Knoxville. Here is my take: The Evade helmet is revolutionary: It is so aerodynamic, it is the 2nd most aerodynamic helmet Specialized has ever made! A close 2nd to the McLaren TT helmet- which is totally illegal and unpractical for all racing but TT. The design success boils down to a new way of thinking about the movement of air- instead of making air go around the helmet, make it go through the helmet. It also solves the old school TT helmet (with no air vents) overheating problem. With clever intakes and scoops, air gets chanelled into the helmet, gets carefully guided through the inside of the helmet, and most importantly- exits through vents in the back. The air gets sucked through the helmet and fills the low pressure “void” behind the head, where everyone used to put a long, pointy piece of plastic. Jet engine technology, really. I was worried I’d run out of gears if there was a strong tail wind, so Dylan sent me the 38T Rotor and I ran the standard 10-42t eleven speed in the back. – To produce high torque, (the “go factor” in sand racing) you need to use a big gear in the front- it also makes the ride more stable. – “Baby powder” the tubes, so they dont stick to the tire. Sand shoes, Caveman style. 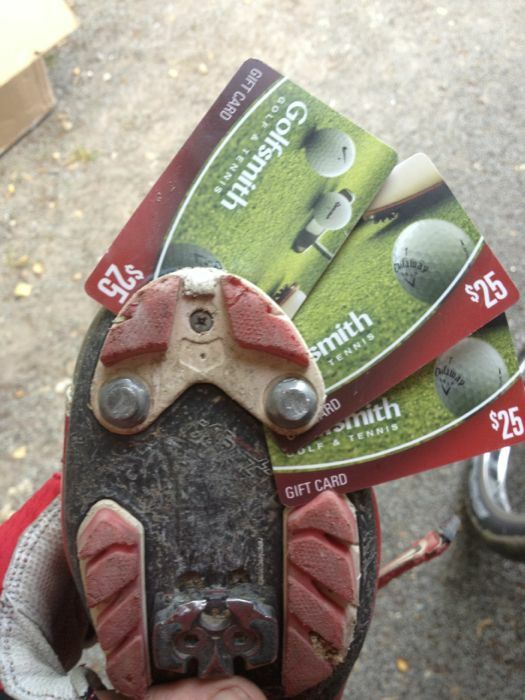 A great idea, but the gift cards had way too much flex. 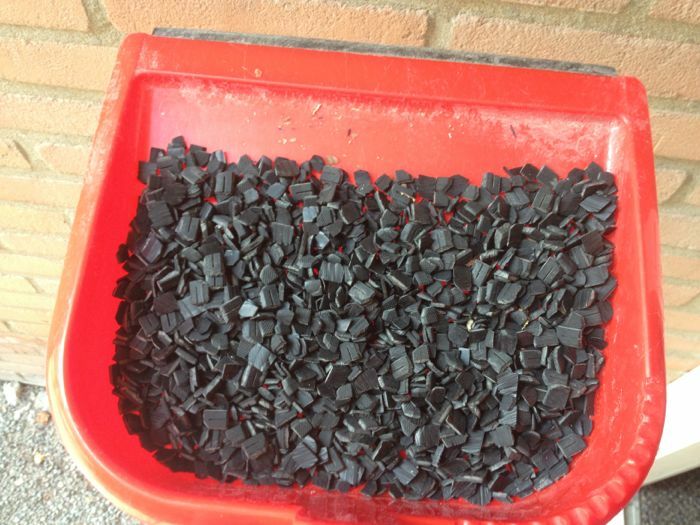 Bet Golfsmith (and Specialized Trivent TERRA) never thought their cards would do duty like this on Kijkduin… To improve the idea I eyed the steel cheese grater at the villa, but I only had 1 day, a Multi tool, knife, bare hands and teeth. Holland doesnt even have rocks. Would’ve been a tall order, so I nixed the idea. Why would a Cave person run in the center of the deep sandy path if you can get some traction in the grass on the shoulders? My dad had a saying: “Winning is not everything. Its the only thing.” I dont agree with that, but winning sure feels good! I’m blessed with amazing sponsors, crew, friends and especially wife (with blisters on her thumbs) who are willing to go the extra mile for me. Thanks so much to everyone who played a part in this milestone win. 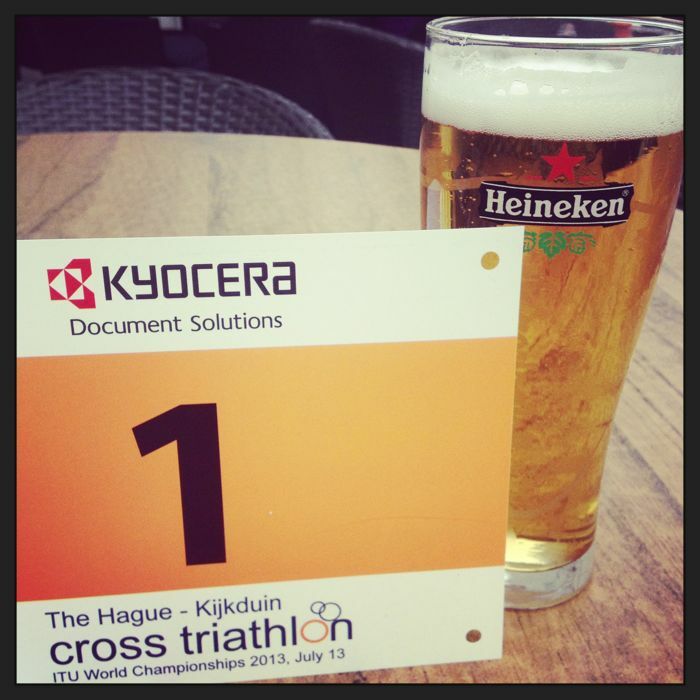 This entry was posted	on Friday, July 19th, 2013 at 4:29 pm	and is filed under Blog Entries, ITU Cross Triathlon, Story time, story time. You can follow any responses to this entry through the RSS 2.0 feed. You can leave a response, or trackback from your own site. 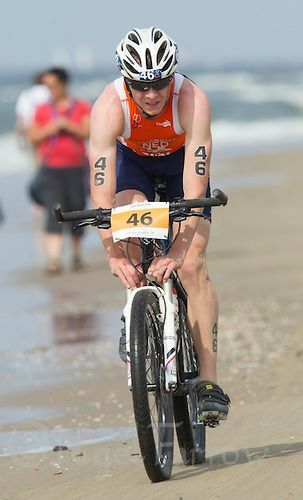 Nice to read your ins and outs from your experience in Kijkduin and all things around, Also congratulations with you World Title of cross triathlon. 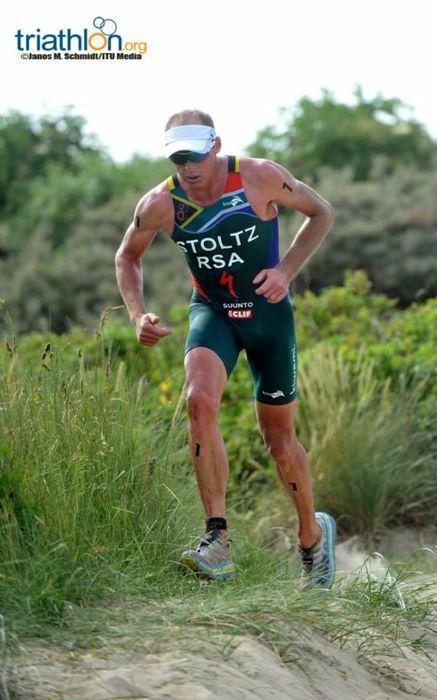 The dutch coach said to me, there is a picture from you on conrad stoltz his weblog.I think it is funny to see myself. On that moment i had a tough moment on the beach. So i thought this position is more arodynamic than hands on bar-ends. Goodluck and maybe i see you again! I use a set of Cinelli Spinaci bars on my MTB for marathon races with long open stretches. Makes a MASSIVE difference. Drop into your aero tuck on the MTB and most times you actually PICK UP speed going into a block headwind. 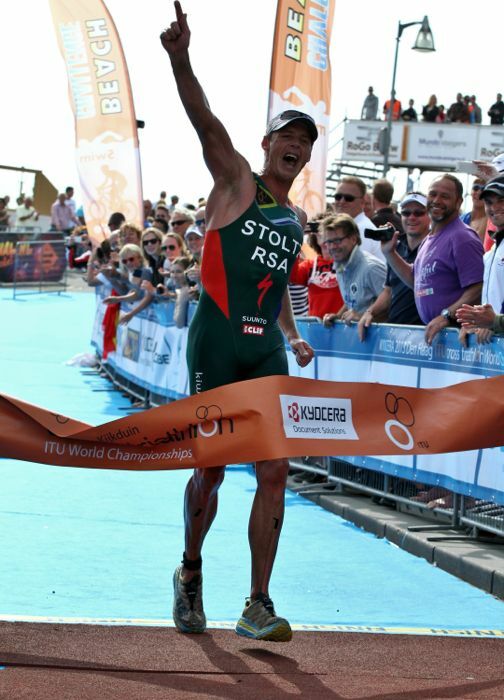 Congrats on another World Title.